Sofia + Sam Flower Laptop Lap Tray with Adjustable Legs is the perfect lap desk for your home, office, or hotel. Crafted from 100% bamboo wood, this laptop lap tray provides a stylish and elegant touch to your home, office or hotel. Built with a sturdy and durable construction, feel safe using your laptop, iPad, tablet, books, drawing canvas, snacks, food and more on the tray. 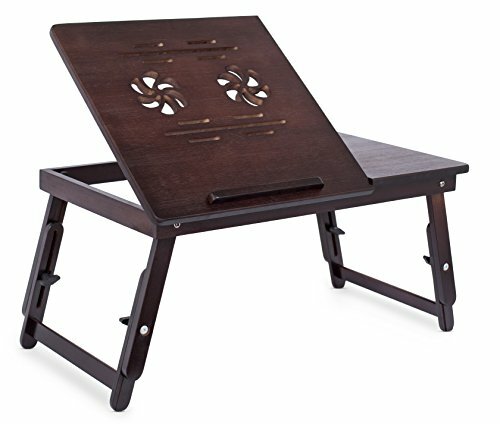 The lap tray is equipped with adjustable legs allowing you to set the bamboo laptop lap tray at the perfect height. The tray table is also equipped with 5 separate tilting positions providing you with comfortable positions to prop up your tablet, book or laptop. The lap desk bed tray has been designed with a magnetic side drawer for storing pens, sticky note pads, headphones and other office accessories. The lap tray is portable workstation that goes where you go. Simply collapse the lap tray down and easily move it to your next work area. Continue to work in comfort wherever you are with Sofia + Sam Laptop Lap Tray.